Escape to our exclusive Bayside Country Retreat, located just north of Kaneohe in an area known as Waikane 'Water of the Gods', on the Windward side of Oahu. Experience true 'Hawaiian style' living, in our spacious custom guest Cottage surrounded by beautiful tropical vegetation and gorgeous sunrise views over Kaneohe Bay and Chinaman's Hat Island. This private country hideaway is comfortably furnished with Hawaiiana rattan and Indonesian furniture. The unique interior with air conditioning, consists of a spacious living room with open beamed ceilings, dining area with counter bar, full kitchen, upstairs two bedroom open loft area with walk-in closet with curtains for privacy, full bathroom on first floor, and wrap around lanai/deck with lovely mountain and water views. Only a short walk (approx. 300 feet) to the lovely palm lined shoreline. Best swimming beach only 3 miles north at the Kualoa Beach Park. Located 25 minutes from Honolulu and 40 minutes from the North Shore. Convenient shopping only ten minutes south in Kaneohe. For many years I have worked as an artist/sculptor...designing decorative elements for the home. And I have managed property rentals for over 25 years. We spend a few weeks each year enjoying our island retreat and getting recharged. We looked for a special location for over 4 years until 1987... when we finally found our perfect island retreat. We built a custom pole house(s) and appointed it with Indonesian/Asian furnishings from our travels and planted extensive tropical landscaping from local farmers. For years we have shared the guest house with travelers from all over the world...with many rave reviews. This is a very unique, exclusive area...located about 10 minutes north of Kaneohe, in an area called Waikane which means 'Water of the Gods'. It's private; has a serene country feel embellished with gorgeous tropical vegetation & fruit trees. Being embraced by the Koolau Mountains and enchanting views of Kaneohe Bay...this property is like no other. Great location...10 minutes to Kaneohe town; 20 minutes to Honolulu & Kailua; 40 minutes to the NorthShore. And close to beautiful beaches all along the coast. Beautiful shoreline, but best swimming beach is only 3 miles north at Kualoa Beach Park. Property is embraced by the beautiful Koolau Mountain range. Property is on the north end of the Kaneohe Bay, with the ocean on the other side of the reef. Beautiful country setting in area of exclusive private acre lots. Property is located on the north end of Kaneohe Bay. Local calls only. Cell phone reception good-best outside kitchen. New A/C split unit keeps entire interior cool and comfortable when needed. Remote located on wall below unit. Full towel sets; also, beach towels. Some spices & condiments. Paper goods. Accented with tropical foliage & fruit trees. Some snorkel gear; boogie boards in lower entry closet. 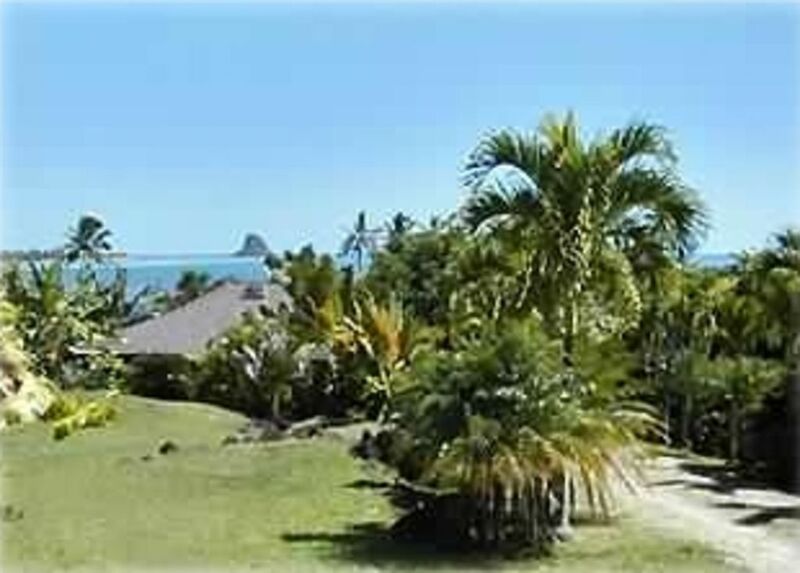 High speed Internet Access; A/C; nearby beaches & Kualoa Ranch (tourist activities), hiking trails, fruit stands & orchid farm. This was our first trip to Hawaii and since we didn't want to be in an area with so many tourist this was the perfect place to stay. Property was very clean and well kept. Lisa was great. She stopped to ask us how things were going and if we needed anything. Very nice view, easy driving to the North Shore area. We would definitely come back again. Mahola Lisa and Dian. Several aspects of the cottage were disappointing. It was difficult to tell from the posted pictures, but the “bedrooms” upstairs are just shared loft spaces, with zero privacy. For two adult couples, it was awkward and less than ideal. The second “bedroom” was tiny and we hit our heads on the low open beams several times. One bedframe has a broken middle support. The linens on the smaller bed had bleached out spots. Several things in the cabin were worn out, unclean, or in disrepair. Several blinds were broken, unusable or unsightly. A bedroom end table had a greasy film residue, which we had to clean. Window sills, air vents, decorative hangings, and loft railings were covered in many places with cobwebs and dust. We had to wash some dishes before use and the kitchen cupboards had numerous items left behind, including old cereal, used peanut butter, etc. (Some items are a plus for renters, but most of this needs to be cleaned out.) The sink in the bathroom is rusting. A pair of old, unconnected speakers in the dining room serve as plant stands. The outdoor equipment was rather disappointing, including the dirty barbecue, moldy beach equipment, dirty styrofoam cooler, torn rain poncho, and broken boogie boards. The driveway is also a slight hazard (we scraped hard until learning to navigate it). In fairness, we did not contact the owner, because: 1) We were unlikely to find alternative housing options in our price range last minute; 2) Based on earlier reviews, the owner is probably already aware of these issues; 3) We had a relatively short stay there. On the positive side, the downstairs is spacious and the cottage setting is stunning, with beautiful landscaping. Further, the location was ideal for touring the island and for its relaxed pace. The back deck was wonderful! In the end, it wasn’t a terrible place, but we wished we had known going in what to expect (so, KNOW BEFORE YOU GO!). It was certainly not in keeping with our other VRBO and similar rental experiences. If the owner ever addresses these items, this will be a truly incredible place to stay. Sorry to hear that you were disappointed in the cottage. Appreciate you letting us know. I have gone over your complaints with our cleaning crew, who will remedy right away. Our schedule has been very busy, so we apologize for some things getting over looked. Our helper, Lisa said that when she saw you briefly to ask if all was well, that you said everything was fine and beautiful...so had she known about these issues, she could of taken care of them for you. At least you liked the surrounding area. May I kindly say that it is a country island retreat, unlike a hotel room. Again, sorry about your disappointment. We loved our stay at the cottage. Beautiful views, comfortable and very relaxing. It's a perfect getaway from the hustle and bustle. Absolutely the best way to enjoy Hawaii. So glad to hear that you all had a nice stay...enjoyed the views and were comfortable! Appreciate your fine care of the the place and hope you'll be able to return some day. Glad you enjoyed your stay and that you felt right at home. Appreciate your kind care of the place, and hope you'll return someday. I was so very impressed. The location and home worked well for myself and girls for their first trip to Hawaii. It could not have been better. This private retreat is located on the north end of Kaneohe Bay, about 7 miles north of Kaneohe, in an exclusive area known as Waikane-'Water of the Gods' ...on the Windward side of Oahu. Watch the sun rise over the Bay and Chinaman's Hat, a small island off the shore. Just a few miles north is the beautiful Kualoa Beach Park for swimming and hiking, and Kualoa Ranch where there's horseback riding and special events. Kailua Beach and Lanikai are approx. 25 minutes south; NorthShore and Waimea Bay are approx. 40 minutes north; Honolulu is about 20 minutes southwest.